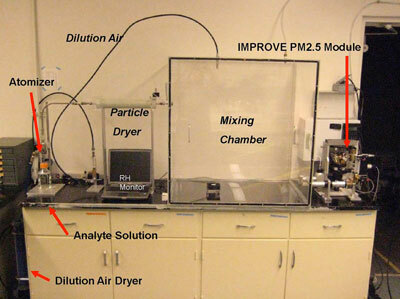 The Air Quality Research Center (AQRC) has developed an aerosol generation and sampling system that provides the capability to produce standard reference materials for improved XRF calibration. We have demonstrated this capability by successful calibrations of various XRF systems for sulfur, sodium and chloride and have extended this capability to other elements including lead standards to support health effects studies. Analytical interferences observed in XRF analysis of particulate matter samples have also been quantified using the aerosol generation and sampling system. Yatkin, S., Amin, H. S., Trzepla, K., Dillner, A. M. (2016). Preparation of Lead (Pb) X-ray Fluorescence Reference Materials for the EPA Pb Monitoring Program and the IMPROVE Network Using an Aerosol Deposition Method, Aerosol Science and Technology. Indresand H and Dillner A.M. (2012) Experimental characterization of sulfur interference in IMPROVE aluminum and silicon XRF data, Atmospheric Environment, 61, 140-147.